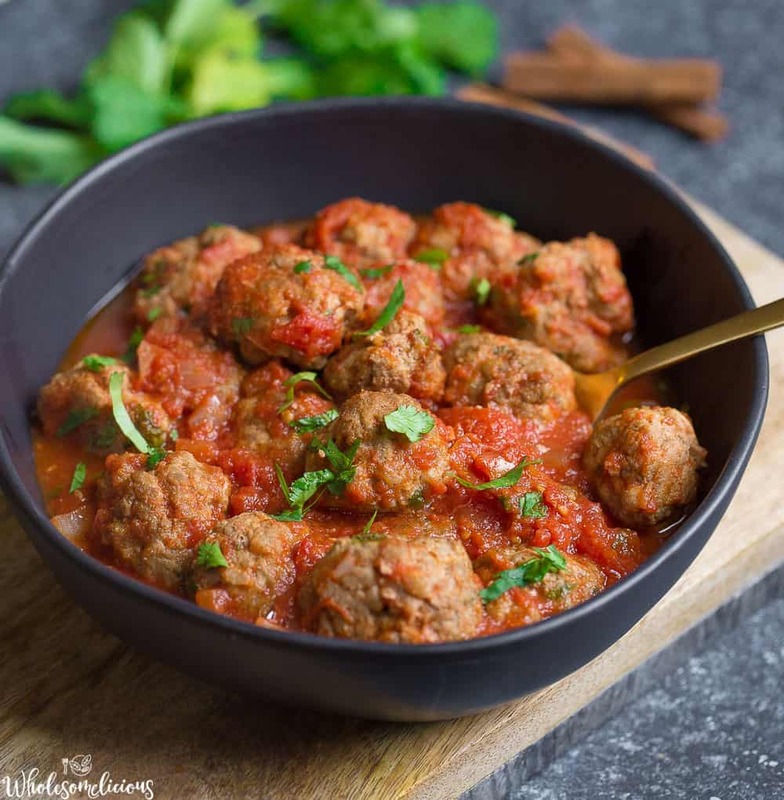 Moroccan spiced up meatballs in a delicious tomato sauce makes for a super tasty dinner! 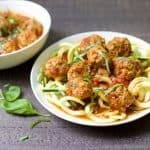 These meatballs are also perfect for entertaining, making a yummy appetizer that is sure to please a crowd. Grain-free, Paleo, and Whole30 approved! Let me just start with a disclosure: I have been to Morocco and had some amazing food in that country! 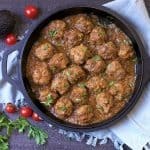 I am pretty sure Moroccans would eat more of a lamb type meatball, or just chunks of meat in a flavorful sauce. But, since I have a slight obsession of making meatballs out of my favorite flavors (i.e. 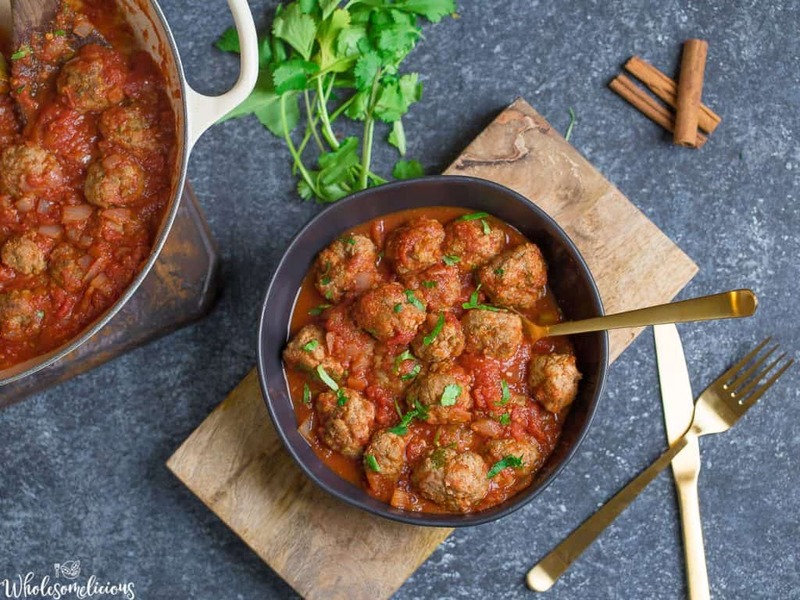 Thai Coconut Curry Turkey Meatballs), we’re ballin this one too. 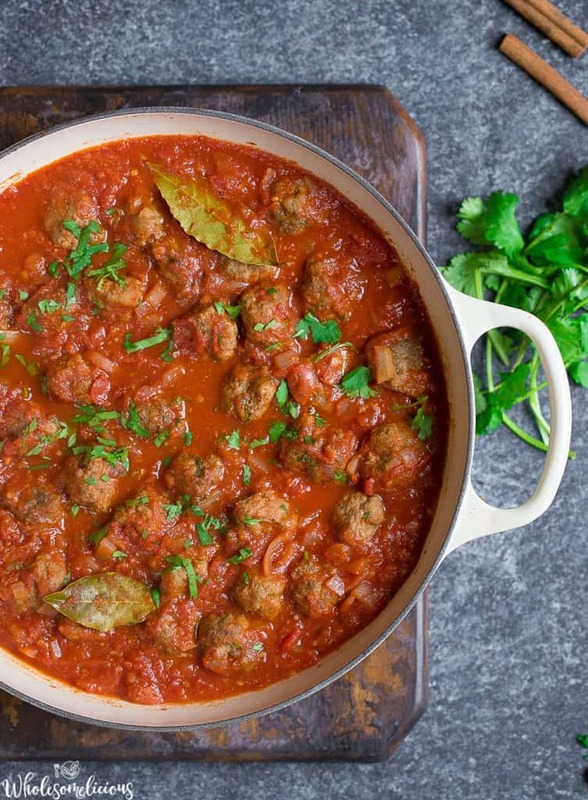 And so now we have Moroccan Meatballs, and just might be my new favorite dish. I have been dreaming up this recipe for quite awhile now, and the real inspiration comes from my favorite little cafe in town that serves Moroccan Meatballs. They are my favorite little “sharing plate” to order. Usually I don’t share, but on occasion I’ll order a few of these plates for the family. They have the most amazing tomato sauce that you can tell is spiced up with tons of great spices and flavors. They also serve with some feta cheese, fresh mint, and fresh cilantro. I usually lick my plate clean. I knew it was time to make these at home. I am giddy excited with the way these turned out. I have been playing around with a Moroccan spiced rub for a Salmon recipe coming to my cookbook, and I used the same mix to incorporate in both the meatballs and the sauce. It’s packed with delicious flavors like cumin, cinnamon, paprika, coriander, and others. 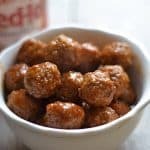 The meatballs and the sauce turned out absolutely perfect! And dare I say, better than my favorite little cafe? Serve plain, over rice, over spaghetti squash, or over vegetable noodles. Preheat your oven to 400 degrees. Line a sheet pan with foil and set aside. Make your Moroccan spice by mixing together spices. Set aside. In a large bowl, combine both meats, 1 tbsp of the moroccan spice, almond flour, egg, and fresh cilantro. Mix with your hands and incorporate the spices completely. Form into 1 - 1.5 inch balls, and place on a baking sheet. Bake for about 15 minutes, or until cooked through. Meanwhile, make your sauce. Heat a large saucepan, dutch oven, or cast iron skillet to medium heat. Once hot, add oil, then toss in onion. Cook 2-3 minutes, then add in garlic and ginger. Cook for another 2 minutes until fragrant. Now add tomatoes, the remaining moroccan spice, salt, and bay leafReduce heat a little, and let simmer while the meatballs are baking. 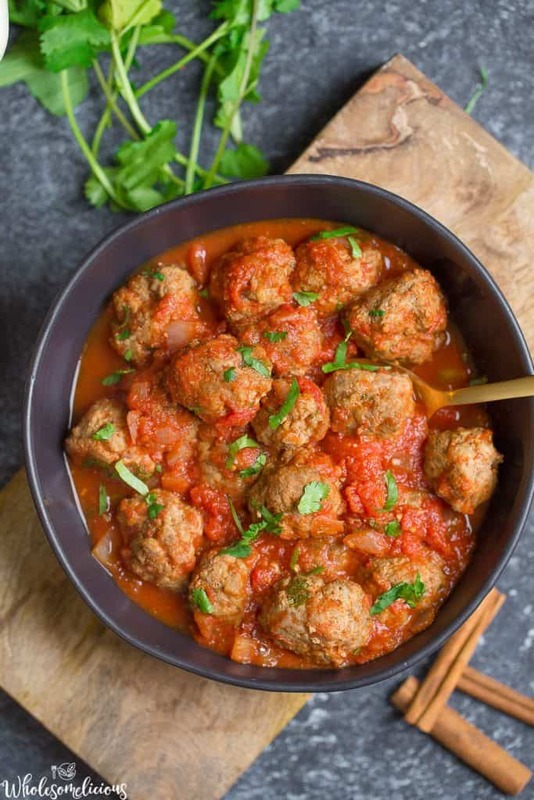 Once meatballs are done, add them to the tomato sauce. Let the flavors meld and simmer for at least 20 minutes. Flavor with lemon juice, salt to taste, and additional cilantro for garnish. 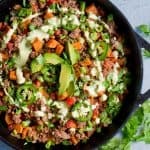 *You can use ground turkey in place of beef. The sausage is also optional and you could use more ground beef (or turkey) in it's place, just make sure you have 24 oz of meat. I liked this recipe very much. Please explain in your instructions when to add the egg!!!!!! After I read through it, I realized it just had to be added to the meat mixture. Also, my family really likes sauce and this needed an extra can of tomato sauce (14 oz) along with the crushed tomatoes. I also used more garlic. Next time I will not put as much cumin in – kind of overpowered it. Still delicious though! Thanks for the catch!! The egg in the meat mixture, I will fix it ASAP. Interesting on the extra tomatoes too. When I made it the first time I doubled the tomatoes and thought it had WAY too much sauce! I guess it depends on how saucy you want it. Thank you for your feedback! 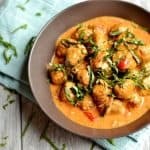 I love your recipes and have been making them for almost two years. I just didn’t see when to add the egg. I know to add to the meat, but thought it should be stated just in case others weren’t sure. This recipe was FANTASTIC! I served it over mashed potatoes made with coconut milk….it was like Shepherds Pie meets Morocco. I love the addition of mashed potatoes! I will definitely try that next time, thanks for your feedback Larry! 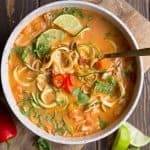 What a great recipe, thank you for sharing! 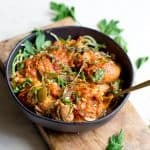 Easy enough to throw together during the week and refrigerate or freeze for left overs but impressive enough for hosting a dinner. I doubled the recipe easily and used all purpose gluten free flour instead of almond (I only did a cup in my double recipe though) and used ground beef and lamb. Our guests loved them and so did we! Thanks again.